According to deep time adherents, some celestial objects just won't act their (assigned) ages. There are many links on this site alone to how planets, moons, and whatnot are showing signs of youth instead of millions of years. Secular cosmologists keep on plugging away with their narrative, even when they repeatedly encounter observed evidence that refutes their predictions. Probably because they find recent creation detestable, despite the evidence. They continue to present things they know are untrue, even according to their mythology. Beginning with Big Bang and deep time presuppositions, astronomers and cosmologists are baffled when galaxies that are supposed to be very old have "stopped forming stars". Not that anyone has actually seen stars forming, we're only presented with presumptions based on their paradigms. Still, there is yet another game changer where the evidence refutes cosmic evolutionary expectations, but the same old song will still be played. Ya wanna dance? When you see the words “challenging” and “requires substantial revision” in the abstract, you know trouble is coming. 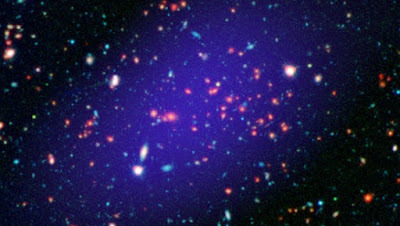 Eleven astronomers from five continents are unanimous: this galaxy doesn’t fit current theory. Here’s what they found, as announced in Nature. To find out what was found and why it upset them so (as well as what they're not going to do), click on "Galaxy Evolution Crisis: Start Over".